May the Fourth Be With You! Yeah, in case you hadn't already been bombarded with pictures of middle-aged men dressed like Wookies at work, today is Star Wars Day. The annual celebration of all things Star Wars comes with two films on the horizon, this year's Rogue One: A Star Wars Story, and Rian Johnson's 'Episode VIII' which is shooting right now in London. 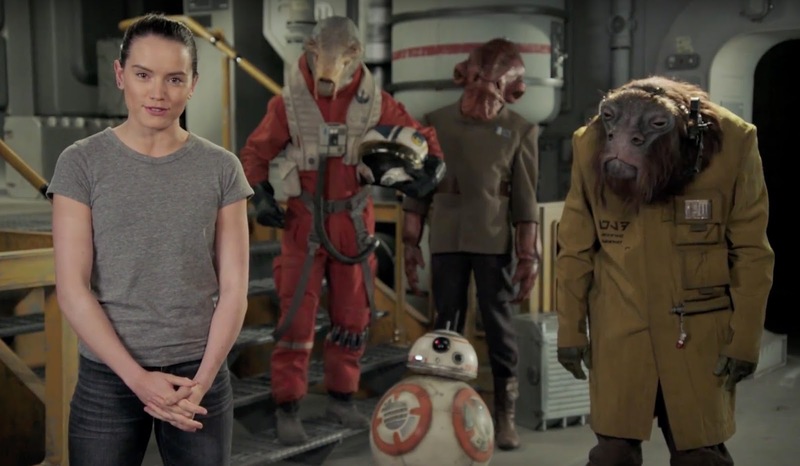 It's from across the pond that star Daisy Ridley has released a greeting to the millions of Star Wars fans. Accompanied by a few alien buddies, she has a few words to say in support of the Force for Change initiative. You can check out that video below! Ridley's next appearance as Rey will be in Star Wars: Episode VIII on December 15th 2017.